(1) How many students can play both the piano and the guitar? 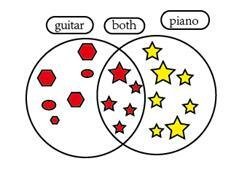 (2) How many students can play the piano but cant play the guitar? (3) How many students can play the guitar but cant play the piano? (4) If there are 7 girls who play the piano, how many boys play the piano?